It took me three years to figure out the lifestyle interventions for Hashimoto's and Hypothyroidism. The website, blog, and Facebook is a great place to begin. You can find additional Hashimoto's details, tips, and interventions there. In addition, we have summarized our research and findings in a 370 page book, Hashimoto's Thyroiditis: Lifestyle Interventions for Finding and Treating the Root Cause. I've come to learn that Hashimoto's is much more than just hypothyroidism! Most patients with Hashimoto's and hypothyroidism will have acid reflux, nutrient deficiencies, anemia, leaky gut, food allergies and adrenal insufficiency. Symptoms of impaired digestion / absorption, anxiety, chronic fatigue and chemical / environmental allergies may be seen as well. Unlike most practitioners that are recommending complementary lifestyle interventions, I am also a Hashimoto's patient. I won’t recommend anything that I haven’t done myself. In addition, I am also a licensed pharmacist. My education and clinical experience bring a unique perspective to the table. The body becomes stuck in a vicious cycle, a chronic state of immune system overload, hypoglycemia, gut dysbiosis, poor digestion, inflammation, and thyroid hormone limbo. This cycle is interrelated and simply adding thyroid supplement to the mix will not result in full recovery for most thyroid patients. The Hashimoto's and hypothyroidism Lifestyle Interventions I have researched and tested aim to dismantle the vicious cycle piece by piece. We start with the simplest modifications, by removing triggers, followed by repairing the other broken systems to restore equilibrium, allowing the body to rebuild itself. 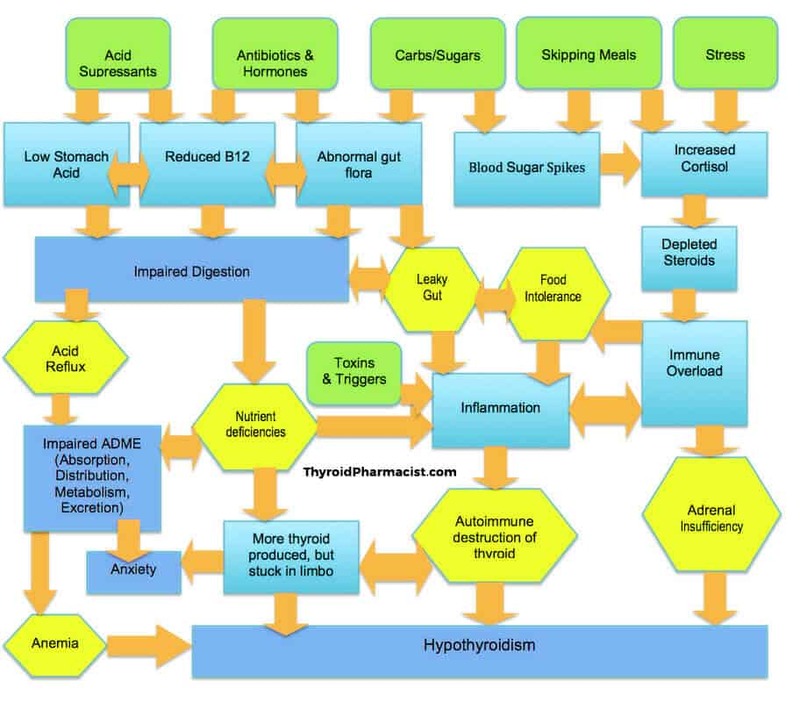 We dig down to why the immune system is imbalanced in the first place and tell you how you begin to finally feel better, reduce your thyroid antibodies and even take your condition into remission.